With a passion for South East Asian food, a love of curries and aromatics, Thailand was the perfect choice for a family mid-winter escape. Despite the fact that our 3 lively children had never flown more than about 3 hours before and a husband confined to a moon boot – we were off to Koh Samui! 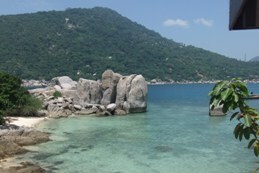 The destination of choice was Koh Samui based on research that showed that mid year the rainfall can be more pronounced on the opposite coastline. However friends were at Phuket at the same time and had little or no rainfall so it probably is the luck of the draw. Koh Samui is an island in the gulf of Thailand. The road around the circumference of Koh Samui is around 50km and is easily driven. Koh Samui was originally reliant on coconut plantations and they are still there today – late afternoon you will often spot trucks heading home laden with coconuts and the monkeys trained to pick them. Rubber is also a commercial operation but the main focus is tourism. After a stint as a backpacker island and the stop off point for the notorious full moon party at Koh Phan Gan, Samui is now a haven of resorts ranging from the affordable to the 5 star +. It is also a spot where many come for cosmetic surgery and the relaxation afterwards – the very smart hospitals scattered around the island are a reminder of this. In general most of the tourism accomodation is concentrated on the North Western side of the island from Lamai up to MaeNam with the busy Chaweng being the hub of tourist activity. In Chaweng you can buy almost anything from street side vendors and there are loads of restaurants and bars. Our choice was to rent a house with a car as opposed to staying in a resort. 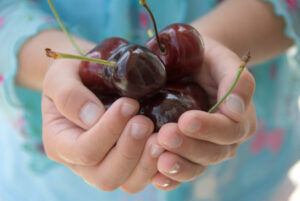 This gave us the freedom to visit restaurants and beaches of our own choosing with ease and also visit the large produce markets and purchase fresh fruit on a daily basis. 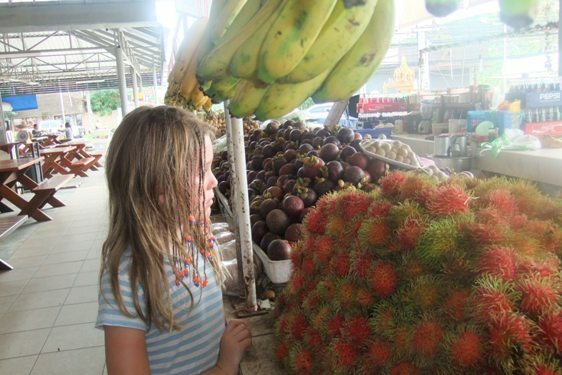 Thankfully although we were there at the end of the mango season they were still available as were the delicate sweet mangosteen, rambutan, longan, watermelon, pineapple, papaya and the pungent durian. The Bophut market quickly became our favourite and the girls behind the counter would start to carve our pineapple as they saw us arriving. I had great intentions of cooking some of our meals but the practicality of ingredients and utensils needed and the cost of eating out soon ruled in favour of eating out and we quickly were into a daily pattern of deciding where to go for lunch and dinner. Like most countries globalisation has hit Thailand and you will find the usual fast food chain store operators plus restaurants offering pizza, pasta and banger and mash! These, however, can be ignored and there are fabulous “hole in the wall” style Thai restaurants making seriously good authentic food at an affordable rate. We took the “when in Rome approach’ and the kids quickly became hooked on chicken satay, Sundried Pork and Pad Thai. Satay is likely to have originated in Indonesia but is definitely a Southern Thailand staple and the kids are pretty happy with my home cooked version. Coming home to a NZ winter there was little chance of emulating the sundried pork but I did come up with a pork spare rib recipe that the kids claim tastes just like the one we had at Shambala. Shambala (23/2 Moo 4 | Big Buddha Beach, Koh Samui, Thailand) was one of our favourite little eating places – it is small with linoleum and vinyl, nothing flash but the food is ever so tasty. The cashews with chilli and salt with a Singha beer were a perfect meal starter and the larb gai, mussaman curry, pad Thai, satay and fried peppered pork ribs were all popular family choices. Ko Pan is another casual restaurant that we visited repeatedly – the beach front tables with thatched covers are the perfect way to enjoy the sea breeze with views down to Ko Phan Gan. You will find Ko Pan when driving from Big Buddha Beach to Boh Phut on the sea side of the road. Thais take their food seriously and will often enjoy 5 (albeit small) meals a day – none of which are instant or processed. Food stalls are everywhere either as fixed premises or people cycling or walking carefully balancing hot urns to take vegetables, meat, noodles and eggs. Unless you are staying at a beach front house or resort, finding beaches to visit can take some navigation – beach access is not always sign posted or available and the exclusivity of the resort will determine as to whether they will allow you to cut through their grounds. We found Mae Nam almost by accident and then went back repeatedly. It is considerably less commercial than Chaweng and while you will get the occasional beach vendor selling food there is none of the pressure to buy beach balls, sarongs, massage or hair braiding. 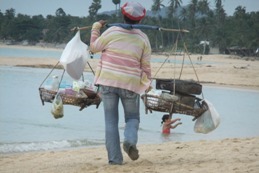 Mae Nam has a relatively quiet, long stretch of beach with great swimming. The Southern end of Mae Nam is probably more suited to young children as the further north you go the more the beach drops away and the water quickly becomes deep. Mae Nam is also where you will have opportunity to find less expensive accommodation and some great little cafes. We used www.tripadvisor.com as a reference point and while most of the referrals were good I have become slightly cynical in the fact that most of us are lazy and will read the top few reviews, patronise these places and write more reviews and the little guys down the bottom of the list just miss out in visitors and a chance to be reviewed. Use your own judgement and just walking along the road will often find a surprisingly good cafe. On an outing to the Tiger Zoo – I had better qualify that Ed had to take the kids to the tiger zoo. 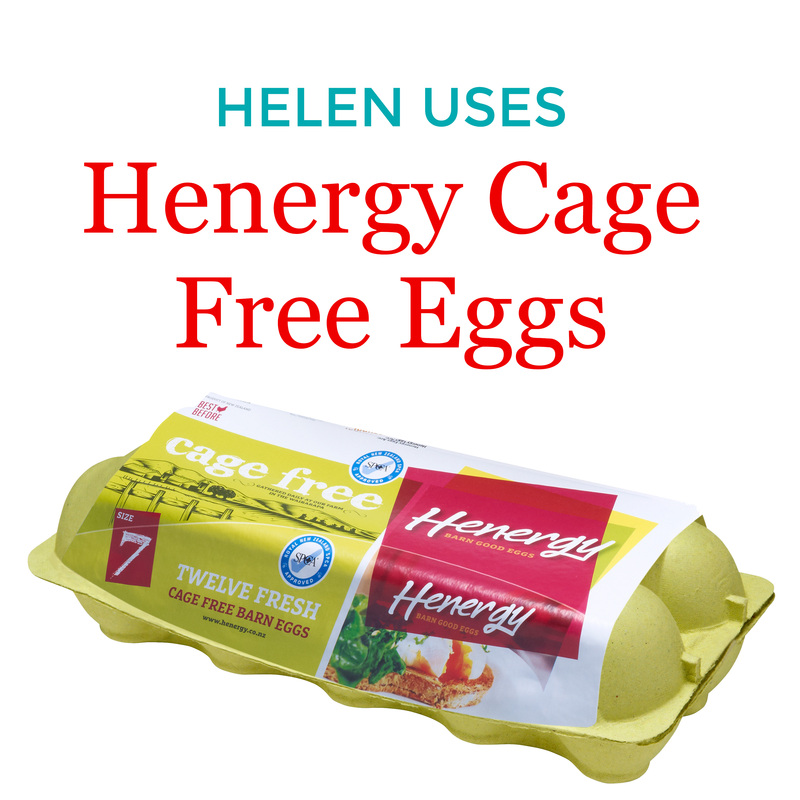 I am completely appalled at large animals being caged and made to jump through rings of fire etc… and feel that by patronising these operations they will continue to keep going. Anyway I diverge, the point of mentioning this is that while we were waiting for a show to begin we went back to the main road and ate at fairly dingy looking cafe on the corner of the main road and tiger farm road – does anyone know it’s name? I had the best chicken with basil that I had in our whole holiday and it would rate as one of my favourite holiday meals. It was around $3NZ and was from a place that ordinarily we wouldn’t have looked at. Further along the southern end of the island is a great and well reviewed restaurant Nuch’s Green Ta’lay – this is open from 3pm and while more upmarket and expensive than the little behind the scenes places, the food is definitely good. 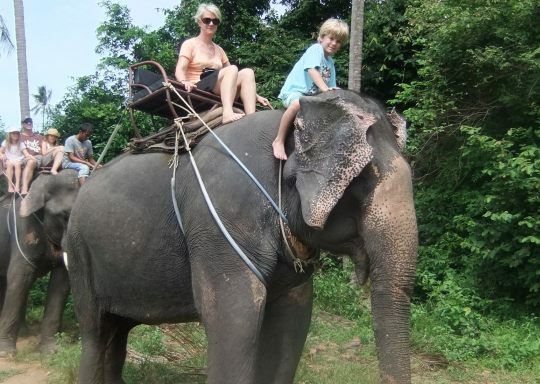 Close by are a selection of places for elephant trekking. Purely by accident we found a lovely place where the elephants seemed well cared for and the keepers genuinely fond of their animals. Emma, our elephant was calm and although the ride was bumpier than I imagined it was a highlight for the kids. Some of the treks are highly commercial and include elephants doing tricks, monkey tea parties etc… I think the Namuang safari park is the one offering these of which I was happy to avoid. I did concede and go to the crocodile farm where large and ferocious looking crocodiles are somehow hypnotised by the trainers who then put their heads in between the jaws etc…. 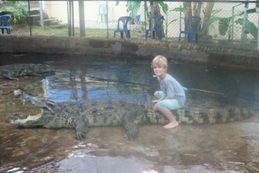 A moment of madness saw my 6 year old Freddie inside the enclosure and posing on the back of a crocodile for a photo. 10 minutes later at feeding time I realised just how real these crocodiles are and the photo moment has haunted my dreams since! He however, grew about 5 cm in the few minutes it took and has new confidence to take on the world! Thais are famous for their massage and Koh Samui has something for everyone from beach front massages to mid range and also the more exclusive spa houses. Koh Samui does have something for everyone and with temperatures in the mid 30s and varying levels of humidity it is just as easy to do nothing and simply kick back by the pool or beach with a good book in hand. Currency: Thai Baht. At time of writing Aug 2011 approximately 100 Thai Baht is $4NZ dollars. Where to Stay :- generally Lamai, Chaweng, Bhoput and Mae Nam are the popular beaches – Mae Nam is traditionally more back pack style and you will find cheaper accomodation there. Look on www.tripadvisor.com for houses to rent. Eating out: – Spirit House (Chaweng) for upmarket, elegant Thai, Shambala and Ko Pan for cheap every day Thai, Nuch’s Green Ta’lay Restaurant if you feel like a drive to the southern end of the island. 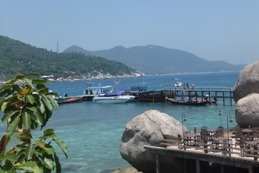 Water acitivities – speed boats do snorkelling and diving day trips to Koh Tau and Koh Nangyuan – check wind conditions first as it can get bumpy and take loads of sunscreen. 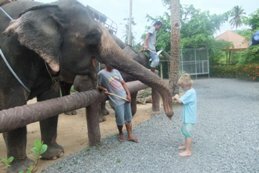 I just found the brochure for the elephant treks and it is part of Living Thailand Tours although as we had a car we just went to the elephant trek part ourselves without gong on an organised tour. Even though everyone tells you how cheap Thailand is, the reality is quite startling. Meals cost no more than a few dollars and usually a lot less, and accommodation in resorts ends up being something akin to backpacker rates here. It’s really crazy. I love the Muslim influence on the food down there too, heaps of turmeric and cumin in curries and wonderful ways with beef and seafood. Funny you should mention the pineapples, as I’ve always thought the ones grown in Southern Thailand are THE BEST anywhere. Incredible flavour. As you drive up the coast from Phuket you pass lots of pineapple plantations. The local bananas are really food too. As soon as Olive is old enough for a 12 hour flight we will be taking her to our favourite spot in Khao Lak (about 1 hour north of Phuket). Heaven on earth. Sounds like a lovely holiday, Helen – although having been to Botswana, where you have to make very sure you don’t sit anywhere near a riverbank, I blanched when I saw the photo of Freddie on a crocodile! I bet it’ll bring you out in a sweat for years to come:). Still, all’s well that end’s well. Yes I agree Virgil although I think resort rates are rising rapidly – particularly in the global chain resorts which seem to be popping up like mushrooms. It pays to shop around with accommodation and to really research what is available beyond the big companies. Sounds like you all had a marvellous holiday. Will try out the Thai cooking receipes. Enjoyed watching you on the Goodmorning show. this web page conations genuinely good funny data too.